Over/Under: Under 169.5 at 1.90 Bet Now! Group A gets us underway in Round 2 of the Eurocup and it’s a cracking game in store for basketball fans. The away team got their Eurocup campaign off to a flying start last week but they’ll know that life on the road is much more challenging than some of the home games in the Euroleague. The hosts will be fired up to get something from this game. The hosts were the team with the blank week last week, so this will be their opening game of the Eurocup season. Nizhny have a strong pedigree in this tournament, having made it to the Semi-Finals in 2014. 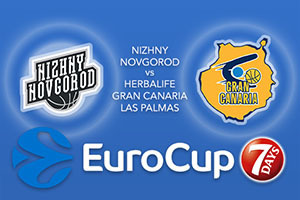 Mind you, Gran Canaria made it to the Finals in 2015 so we have a game between two teams who know how to mix it up in this tournament. Kenny Boynton and Deandre Kane have looked good so far for Nizhny and if they are going to push home an advantage in this game, these are the players who will have to stand up. Maxim Grigoryev is an injury doubt for the hosts. A big 101-76 win over Cedevita Zagreb saw Gran Canaria get off to a strong start and with 25 points, Kyle Kuric was one of the key players in the game. He was the clear leading scorer for the winners with Pablo Aguilar offering up 13 points and Darko Planinic providing 12 points in the win. After half an hour, the score was 77-61 but a very strong final ten minutes of the game saw Gran Canaria off to a strong start. This will be the foundation for this week’s action although it is going to be a much tougher affair for the Spanish side this time around. The away team is being backed well by the bookies but Nizhny will want to come out flying in this game. This is why taking Nizhny Novgorod at +8.5, on offer at odds of 1.90, is likely to be a decent bet. If you’re looking for the Over/Under market for this Tuesday night game, you should look to go UNDER 169.5 which you can find on offer at odds of 1.90. Bet Now!